Lake Forest College's Sonnenschein and Albright galleries host a variety of artists each year, yet none have exhibited anything nearly as mouthwatering or tempting as Lauren Brescia. Like a step through Marie Antoinette's extravagant parlor, complete with delectable half-eaten cakes and pastries, Brescia’s 2001 installation exhibit Parlour. 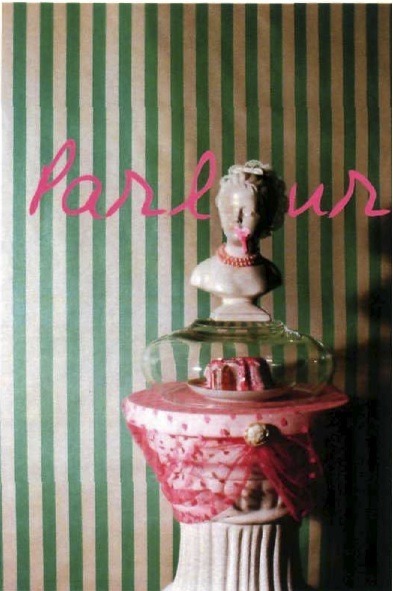 Draping and painting the gallery with candy-like colors, Brescia set up a pedestal upon which she placed a small frosted cake, sheltered by a clear glass dome, and then topped with a found female bust wearing pearls and dripping frosting from her mouth. [fig. 1.7] Whimsical and feminine, and informed by Brescia’s knowledge of cake decorating, the piece examined the decadent excess of food (as was seen in early food art) and explored the process of food decay as a natural occurrence. Click here to see more of Lauren Brescia’s work.